Ruth talks about how to make chocolate cheesecake. Akane: Hey, Ruth, how are you at cooking? Are you any good? Ruth: Not really if I'm honest. Akane: Oh, OK. Well, is there a one recipe that you know how cook really well? Ruth: There is actually. 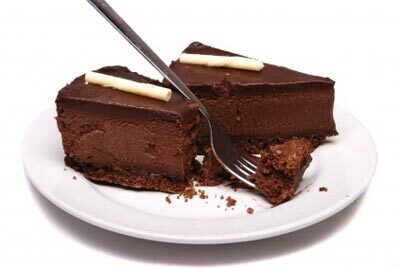 It's chocolate cheesecake. Akane: Wow! That sounds really good. So what kind of ingredients are in this chocolate cheesecake that you're talking about? Ruth: Well, you need chocolate spread, digested buscuits, condensed milk, and you also need cream too. Akane: Wow! And where can you buy these things? Ruth: Well, normally I buy them in the supermarket. It's quite convenient. Akane: OK, and it's pretty easy to find? Ruth: Very easy to find. All of these ingredients. Akane: And what kind of utensils or equipment do you need to make this cake? Ruth: Well, you need a baking tin, which has got an open bottom and you also need a whisk and you need a bowl and you need a fork, and other than that I think that's about it. Akane: I see.....Now, how do you get started with this recipe? What do you do first? Ruth: The first thing that you do is you crush the digested biscuits, and so that they're like crumbled, and then you heat the butter, and you add the butter to the digested biscuits. Akane: OK, well that sounds easy enough. And what do you do next? Ruth: Well then you leave that in the fridge for a day, then when you come back to it, you whisk the cream, you whip it up, and then you add the condensed milk to the cream with the fork very slowly, you fold it in. Akane: Oh, fold it in. Is that hard to do? Ruth: It's quite, yeah, it involves skill. It's quite delicate. Akane: OK. Is that it? Is there any other steps? Ruth: Well, then you need to heat the chocolate spread up and you need to add it to the top and fold that in as well. Ruth: And then that's the end of the cheesecake. Akane: Oh, OK. Now, with this recipe is there anything you need to be careful of? Ruth: Not really, I mean it's quite easy, but the main thing is that you leave the digested mixture in the fridge for long enough, and then after the whole cheesecake is ready, you still have to put it back in the fridge. I'm always tempted to eat it immediately, but you have to wait a few hours for it to cool. Akane: Oh, that sounds great. Thanks Ruth. What kind of ingredients are in this chocolate cheesecake that you're talking about? I wanted to make cookies, but I didn't have all the ingredients. She always uses fresh ingredients to make pizza. What kind of utensils or equipment do you need to make this cake? Do you have a spoon? I forgot to bring a utensil for my salad. There aren't any clean utensils in the house. Please wash some. You also need a whisk and you need a bowl. First, mix the egg and the sugar with a whisk. You must move the more rapidly or the bread will not be good. You add the condensed milk to the cream with the fork very slowly, you fold it in. Fold the nuts into the dough very carefully. First add the chocolate pieces and then fold them into the batter. It involves skill. It's quite delicate. The dough is very delicate. If you mix it too long, you won't succeed. The cookie was very light and delicate, perfect to eat with tea.